I have had a lot going on the last few weeks. 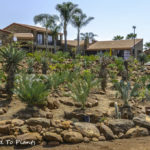 As most already know, I am in the process of doing a pretty large landscape remodel and trying to coordinate all that with a busy summer schedule. The concrete work went in last week and next week the topsoil arrives for me to finish off the planter beds. With all the time coordinating with cement guys, sprinkler guys, door guys, etc., I decided that I wanted a project that just my son and I could work on. 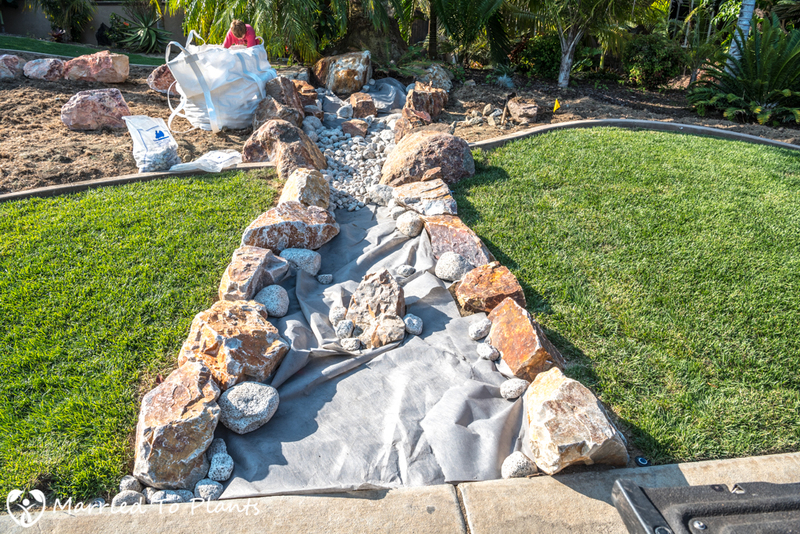 I have always wanted to incorporate a dry creek bed into my landscape, and now with the remodel underway, there was no better time to build one. Dry creek beds in landscapes can be a funny thing. While gathering creative ideas, the overwhelming majority of the ones I found online were pretty terrible. 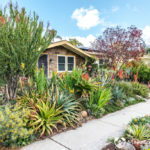 Most didn’t even resemble what a dry creek bed would look like in nature, with many simply ending up as artificial eyesores (in my humble opinion). During the planning stage, I didn’t think it would be too difficult to make mine look natural. However, while building it, that proved another matter. Meeting my standards definitely turned out more challenging than anticipated. Sadly, I was not able to completely finish mine in time for this post. But you will get an idea where I am going with things, as it is currently 95% complete. I just need to plant a few things and it will be 100% ready. The first step was of course to plan out where you want it. 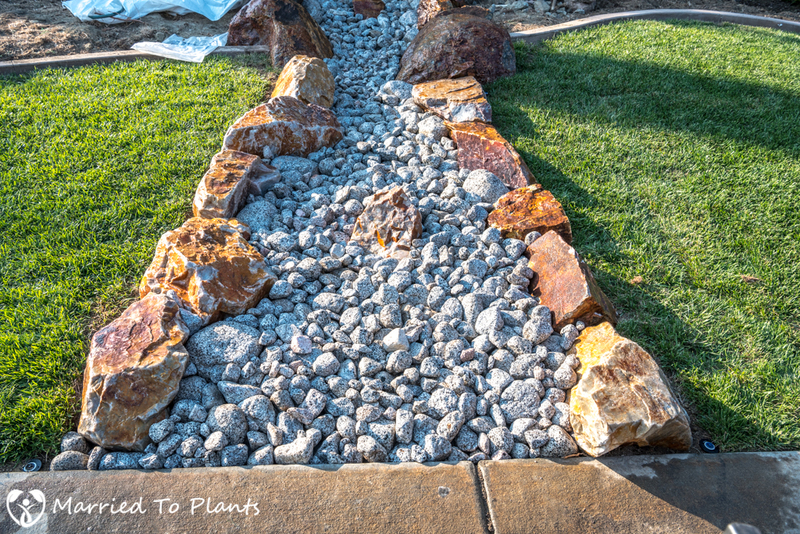 I wanted my dry creek bed in the front yard and I wanted it to flow through a planter bed and the grass in the front yard. 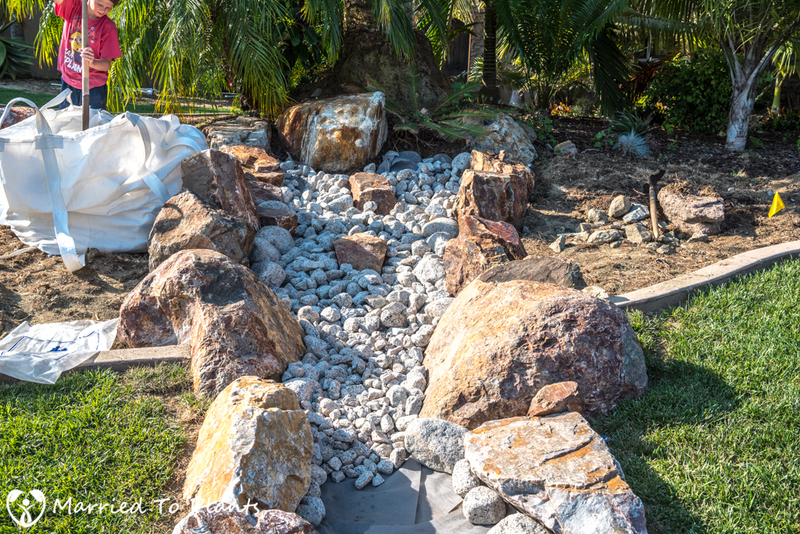 KRC had already delivered rock for my concrete work, so I made sure to have the extras placed roughly where I would dig out the dry creek bed. I dug out the grass to provide a rough design pattern. I used varying widths in spots to hopefully help with a natural look. 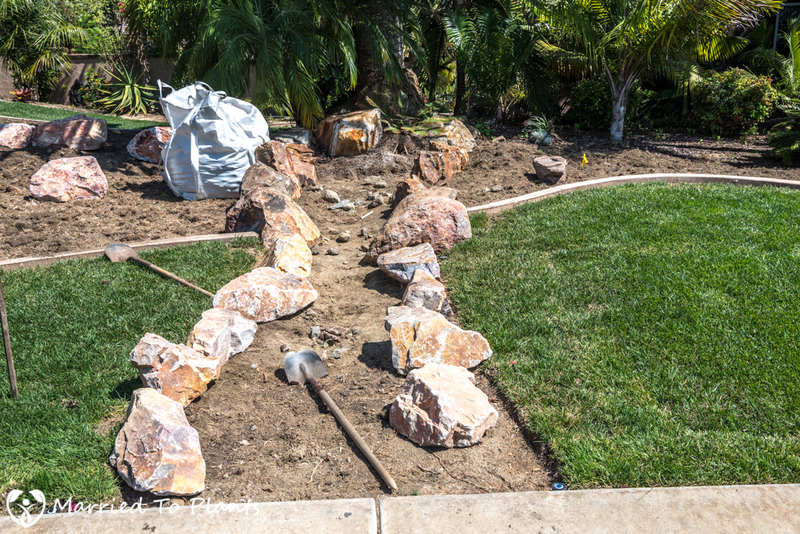 Once the grass was removed and a few boulders were put in place, I settled on my design and got ready for the next step in the process. 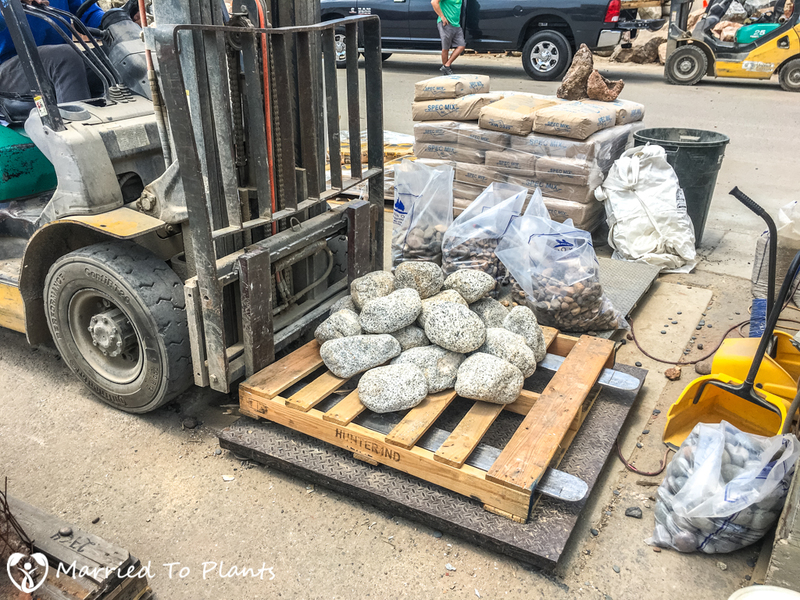 That next step was to have KRC Rock come back with another load of boulders. Having access from the road made it really easy on us to set the stones. Had I build this in the backyard, we would have had to use a tree dolly to wheel the stones into the backyard. This is what it looked like after KRC Rock left my house. The hardest part of this entire project was coming up next. It was also the most important, in my opinion. 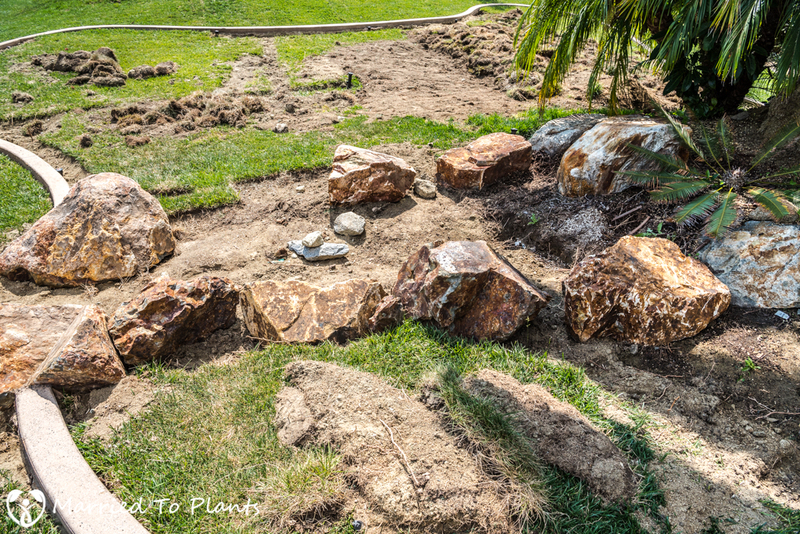 That next task was to move all these heavy stones around and fit them together like a jigsaw puzzle in order to provide the most natural look. So with a crowbar in hand and after preparatory dose of Aleve, I started putting the puzzle together. All said and done, it took me about two hours to get everything in just the right place. 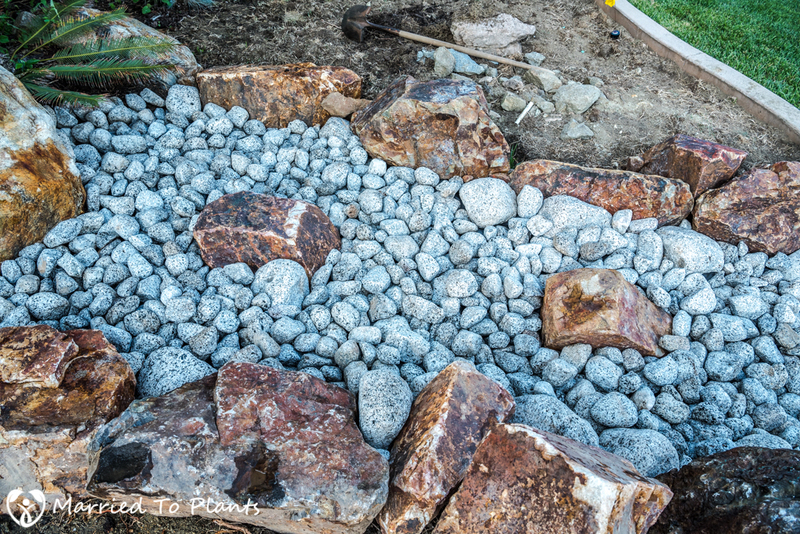 One of the obstacles I had was placing the stones where grass will be growing when finished. 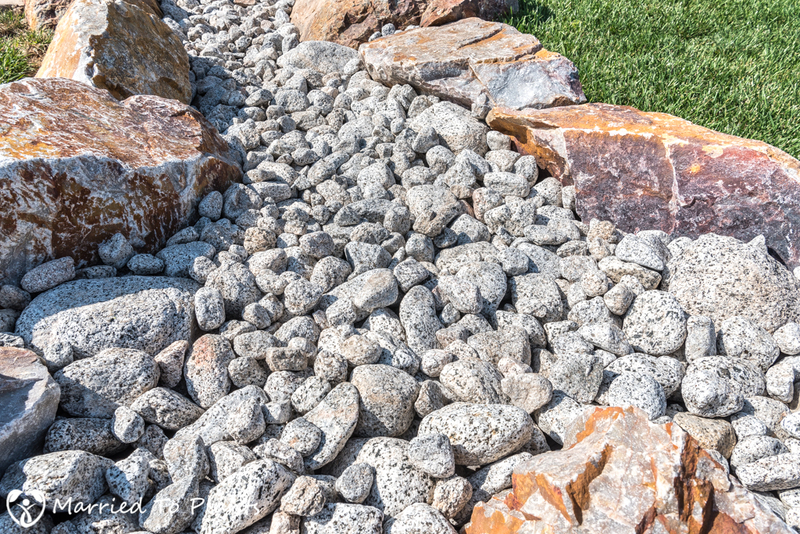 You really need to pack the rocks tight to prevent your grass from invading the dry creek bed, and you must also plan for how you will mow and trim. 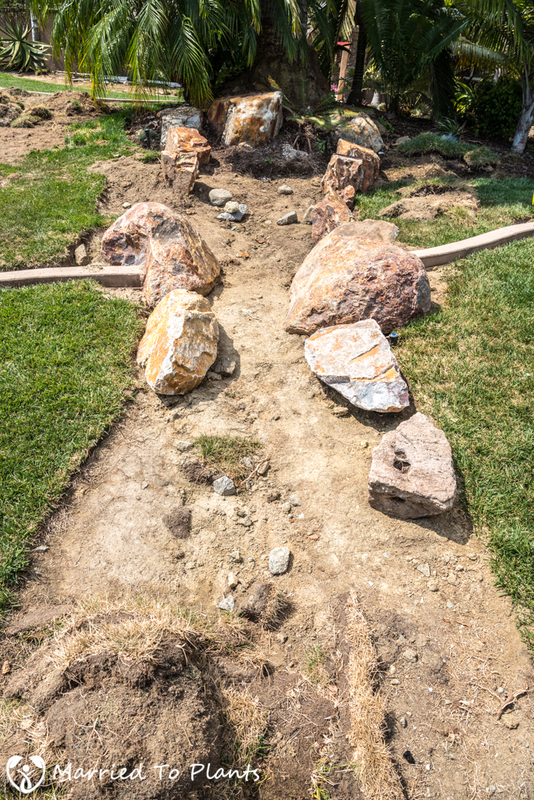 I set most of the rocks in the front part of the dry creek bed with the long, flat part of the rock exposed towards the grass, as you can see below. 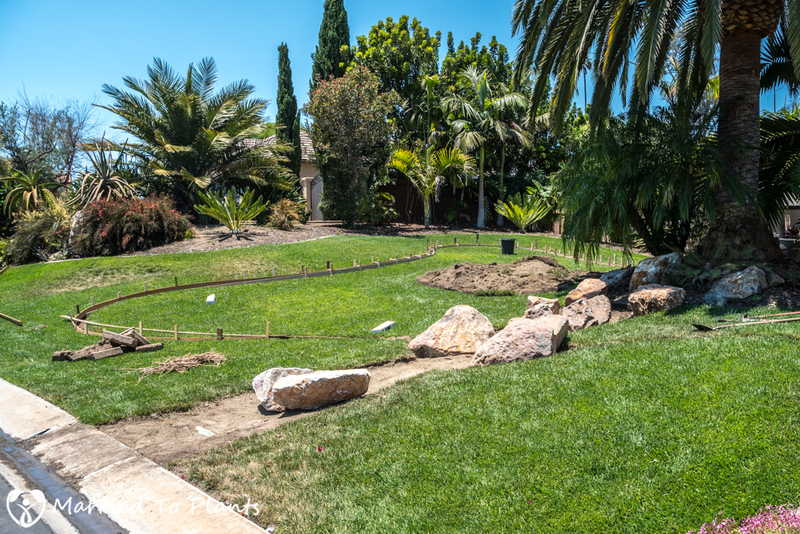 Once I gave myself the thumbs up on placement, I began to lay down small pieces of old sod against the rocks to fill in the exposed areas. 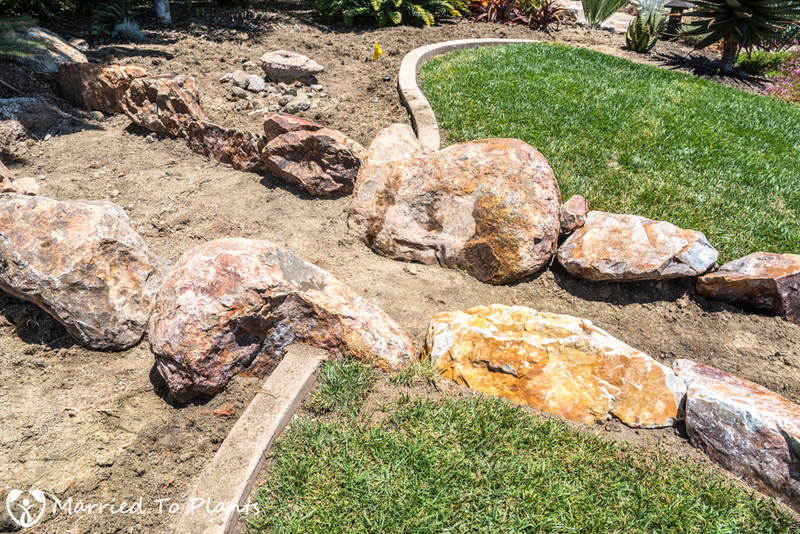 The boulders I used in the front where it cuts through the grass are called Honeycomb Quartz. They’re already found throughout my front yard landscape, so I thought it wise to match them for the dry creek bed too. Plus, Honeycomb Quartz are easier to find with the elongated, flatter appearance than most other rock at KRC. 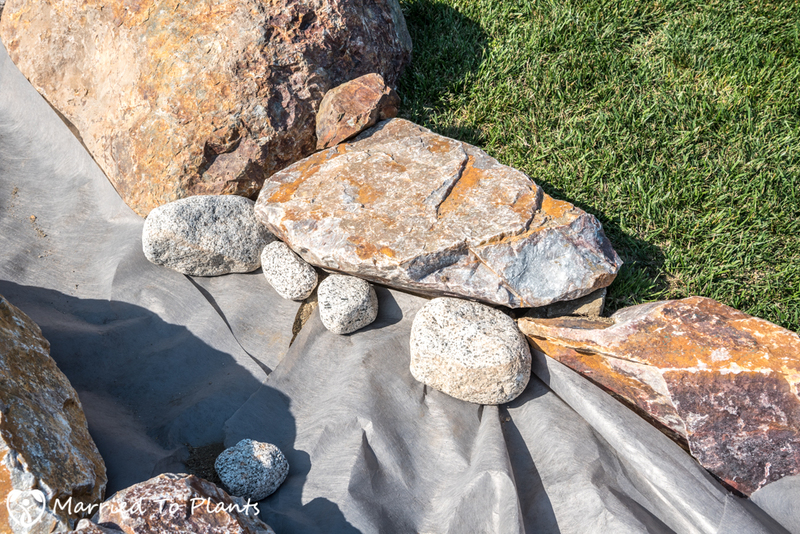 The flat rock surface makes it really helpful when I have to trim the grass, as there are not a lot of jagged edges or pockets for grass to grow. 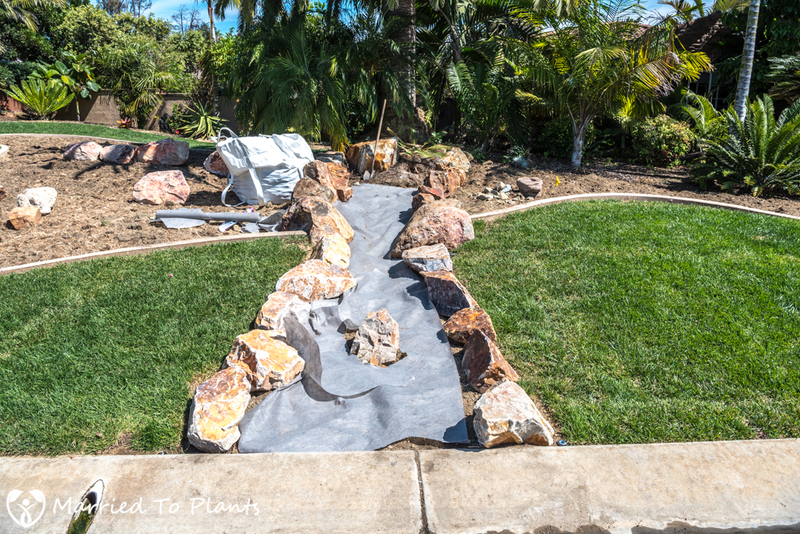 Instead of carrying the same Honeycomb Quartz boulders all the way up the dry creek bed, I decided to use the mow strip as a dividing line to put different stones where the planter bed is. I went with a darker stone and one that is more rough in texture. 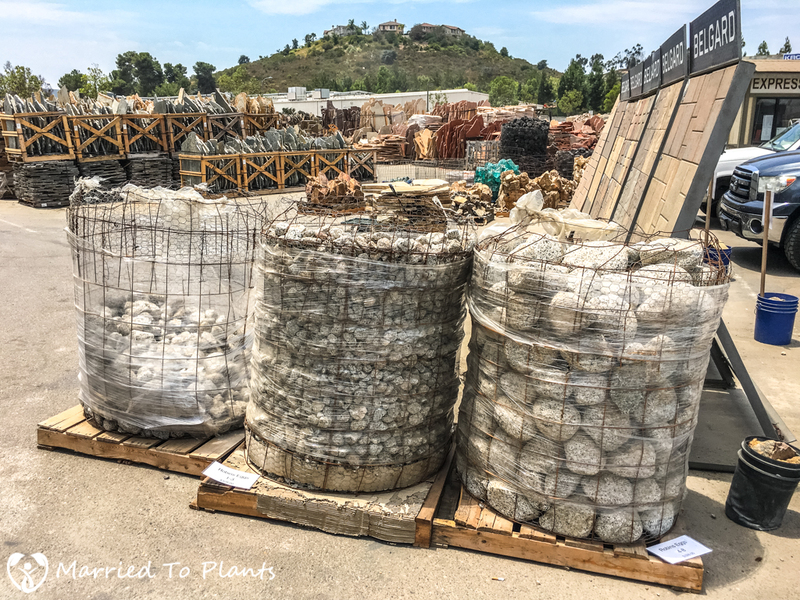 These stones are called Baja Cresta and I believe they will work better than the Honeycomb Quartz once paired with the aloes and agaves that will soon be added to the planter bed. The next step in building my dry creek bed was to add a weed barrier. 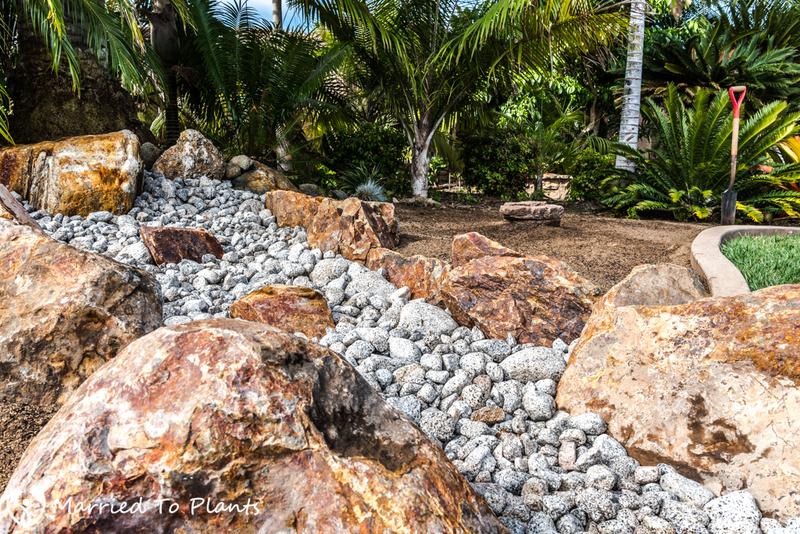 I have put in some rock gardens in my landscape where I didn’t use the weed barrier. I have regretted it ever since. 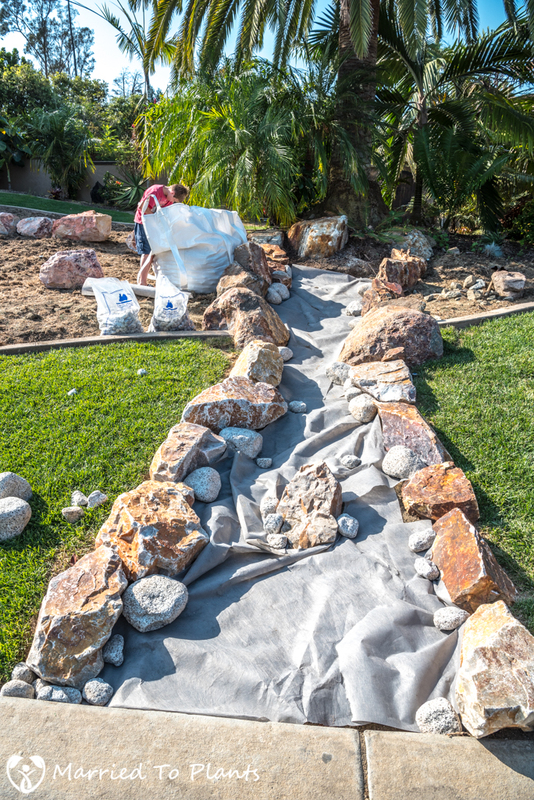 For how little it costs and how quickly it can be put down, it really should be mandatory for anyone planning their own dry creek bed. Back to KRC Rock to purchase the river rock that will go in the center of the dry creek bed. I walked around the rock yard for a good 30 minutes before settling on a new pebble they literally just brought in. It is called Robin’s Eggs and it is a white pebble with black flecking. I would purchase 1 ton of the medium sized pebble for the base layer and have it delivered. 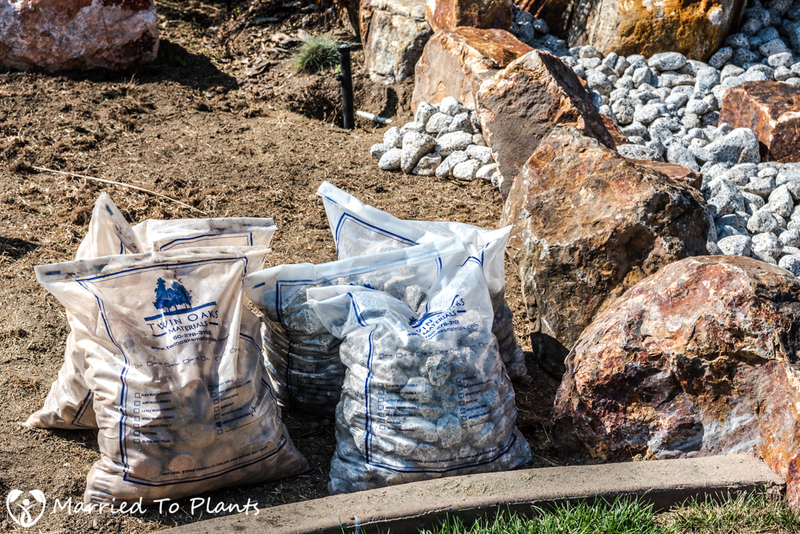 I would also purchase five 75-pound bags of the 1-3 inch small pebble as filler rock and 25 larger Robin’s Eggs stones that are also purchased by weight. Once back home with the larger pebble, I began to place them against the border stones. 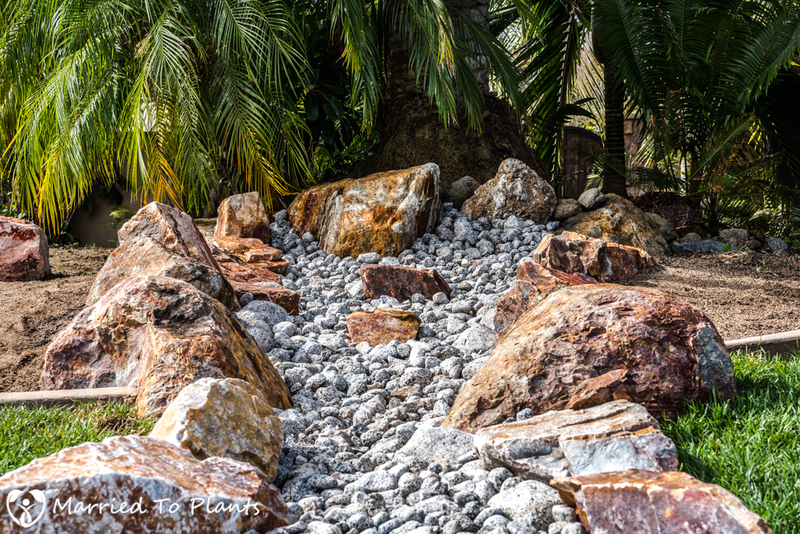 Having these larger pebbles against the boulders gives the dry creek bed that more natural look. In hindsight, I wish I had purchased more of the larger pebble, but there was no way I was going to head back to KRC Rock again. This project was already much more expensive than I budgeted for and I certainly wasn’t going to fight the traffic on the 78 Freeway. So I would make due with what I had. 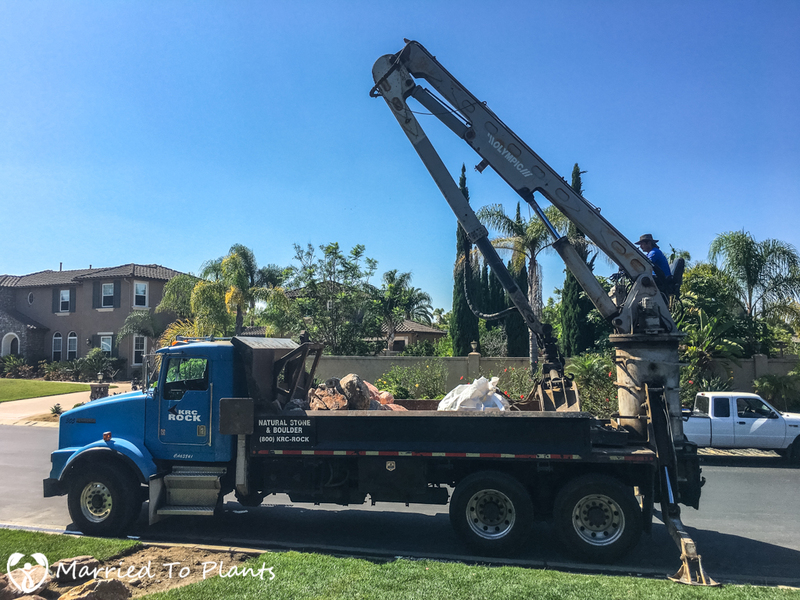 With my son’s help, we unloaded the 1 ton of the mid-sized pebble to cover the dry creek bed. 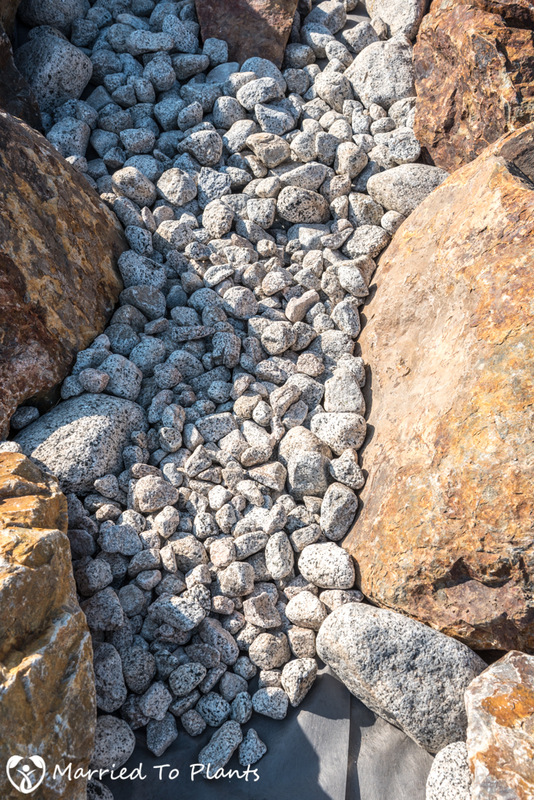 In the narrowest part of the dry creek bed, between the two largest boulders, I added only the small 1-3 inch pebble. 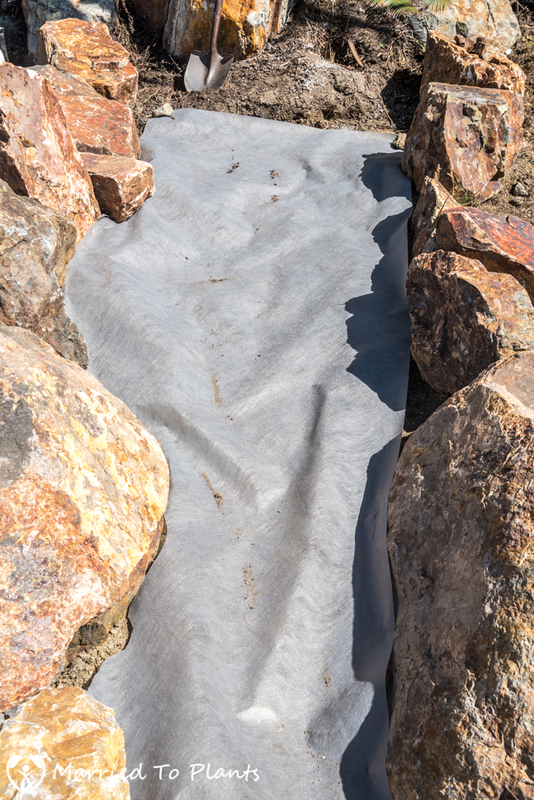 When you look at a dry creek bed in nature, the narrower areas where the water flows the fastest are where you find smaller rock, whereas the wider, slower areas have the bigger stuff. A photo of yours truly: my son snuck this shot of me placing the medium sized rock. This is how my son and I placed the overwhelming majority of the rocks. 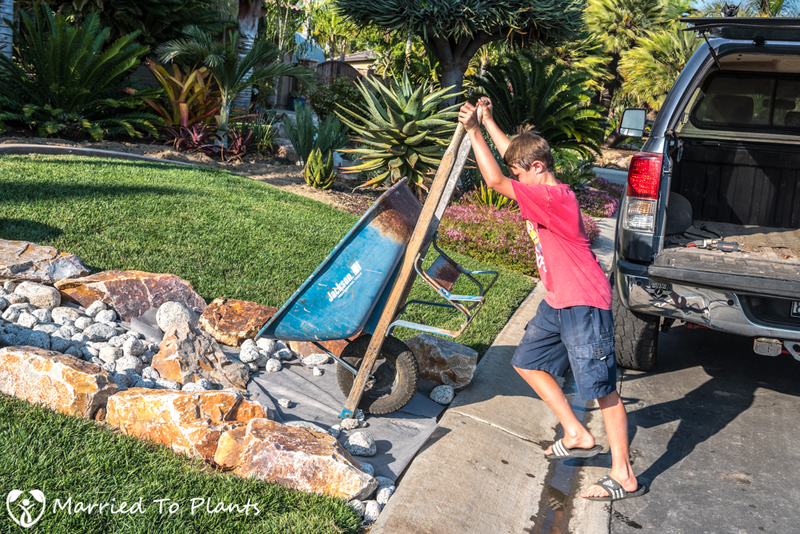 My son, who is always thinking of easier ways to do things (he is smarter than his old man) went and grabbed the wheelbarrow to get the stones placed at the bottom of the dry creek bed. 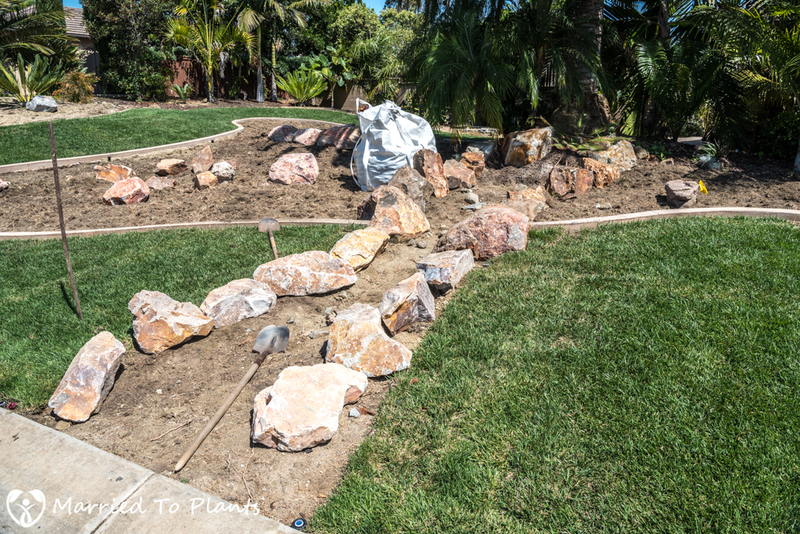 Southern California has had very hot and humid weather recently, and the peak seemed to happen while my son and I worked on this project. My son is a hard worker and stuck with it through completion. It afforded me time to spend alone with my son and he earned 2 hours of Play Station video game time and $15 for the roughly 3 hours he helped me out. With all the medium sized Robin’s Eggs pebble in place, the dry creek bed was actually beginning to look like one. The photo below shows my son washing off the dust and dirt from the Robin’s Eggs pebble. 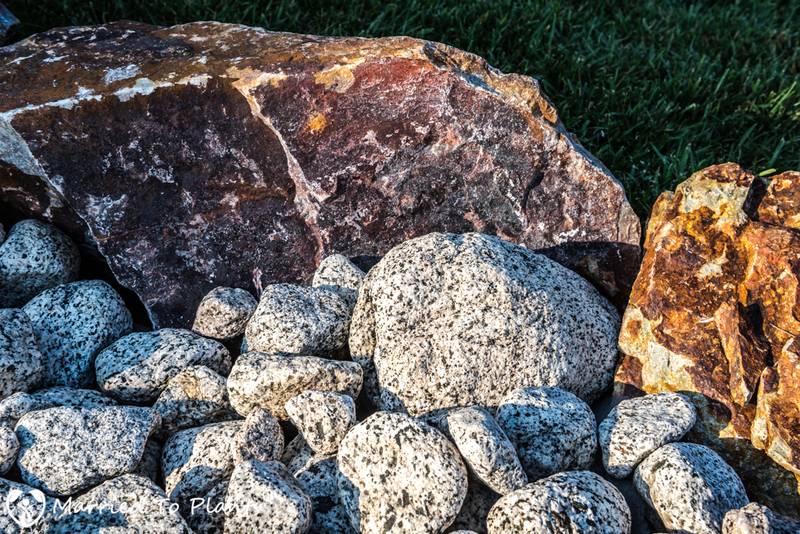 Once washed off, the Robin’s Eggs pebble looked really good against the darker side boulders. The next step was to use the 75-pound bags of the 1-3 inch pebble as filler. 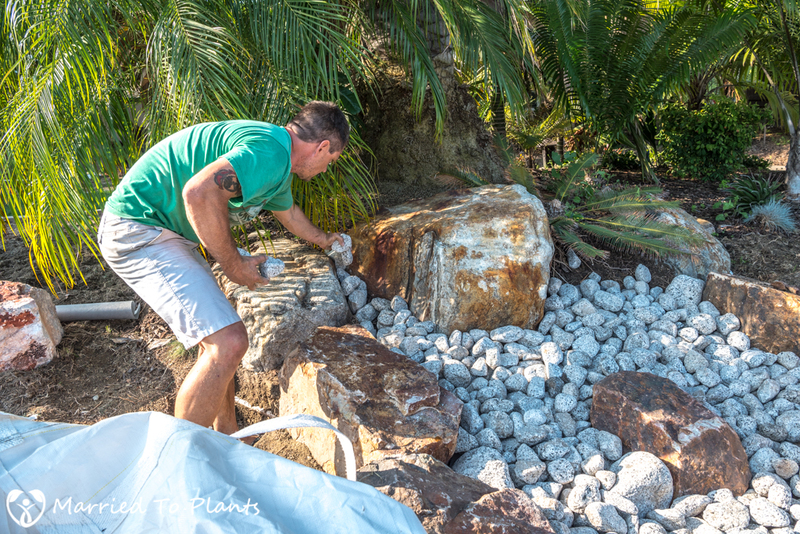 With any rock work I do in my garden, I always finish the project off with smaller filler rock. 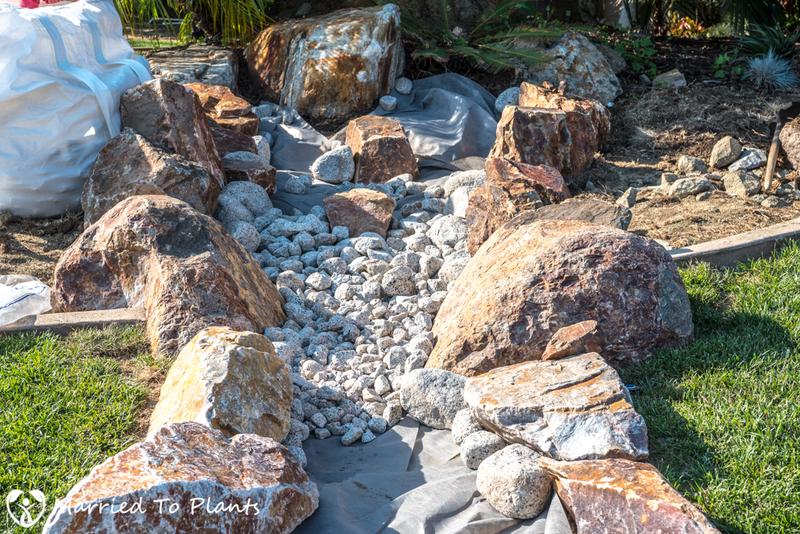 The smaller pebble will fit into areas the larger rocks couldn’t, and cover up any remaining weed barrier that might have shown. 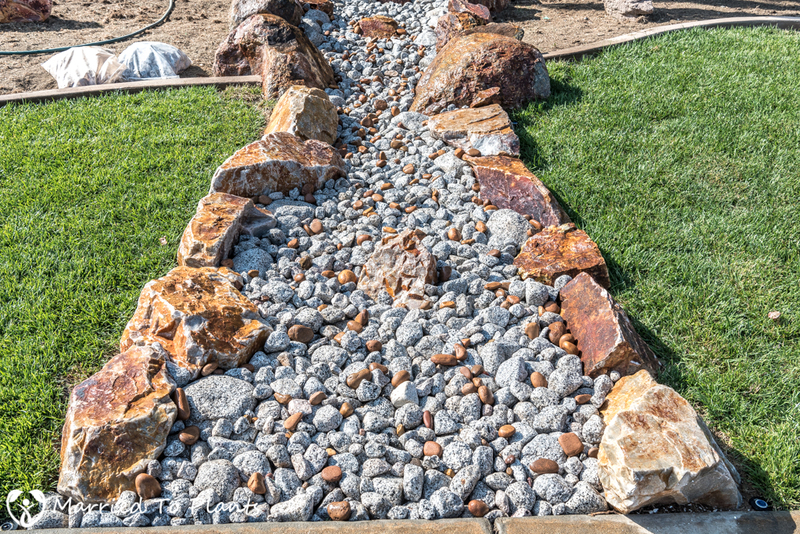 It also makes the dry creek bed more natural. Below you can see how the smaller pebble fills in the exposed gaps quite nicely. OK, now to show where I “jumped the shark” with this project. After washing off the Robin’s Eggs and looking at the dry creek bed the next day in bright light, it appeared to me to be too much white. 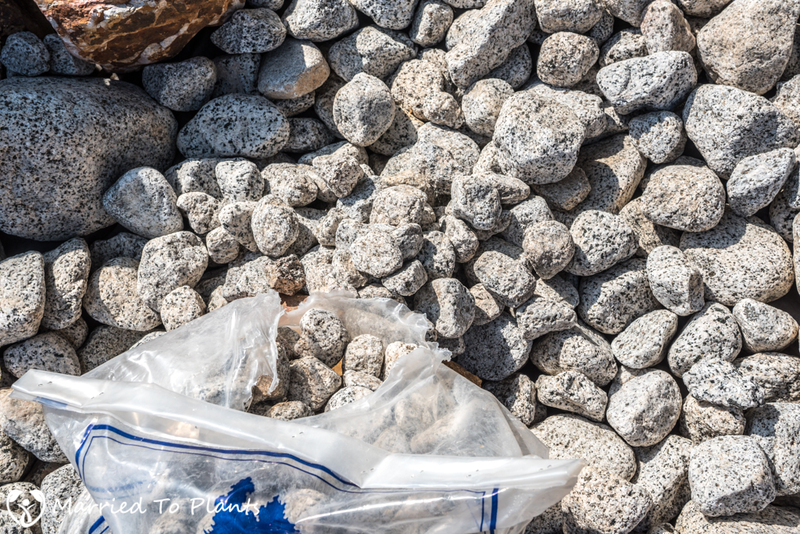 In an attempt to remedy that, I purchased two 75-pound bags of Mexican Sunburst pebble. 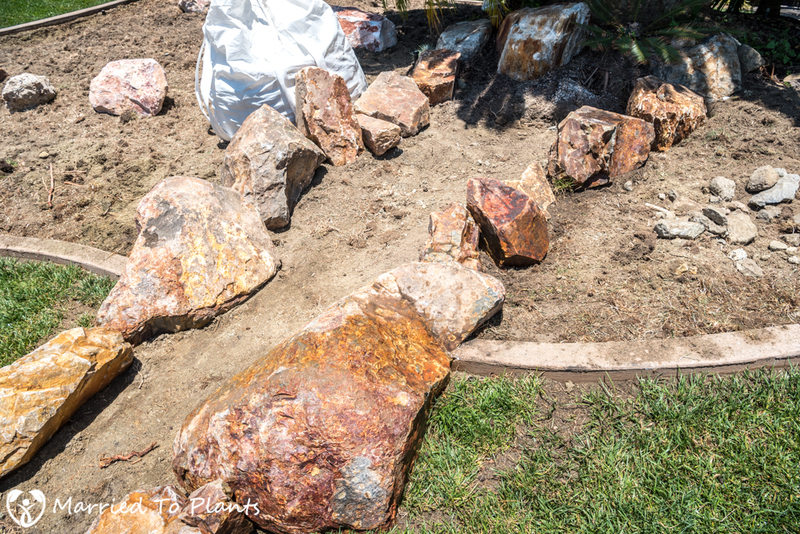 Going in, I figured the brown stones would take the edge off all the white and work well with the large side boulders. 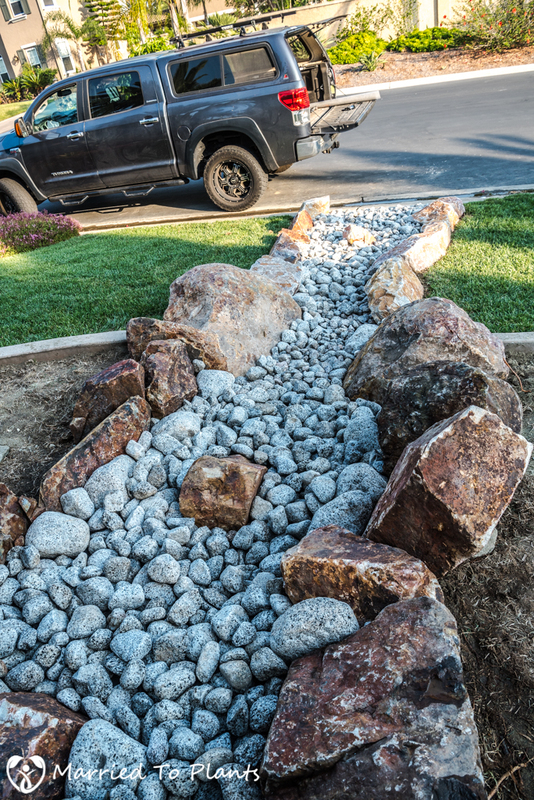 Once the Mexican Sunburst pebble was added, this is what my dry creek bed looked like. Yeah, I wasn’t a fan either. So my son found a new job to do to earn more Play Station time. Of course that involved picking up all those Mexican Sunburst pebbles and leaving only the white with black-flecked Robin’s Eggs. With the Mexican Sunburst removed, it was time to move on to the next step. This step required soil and coincided with the planter bed work I was doing. 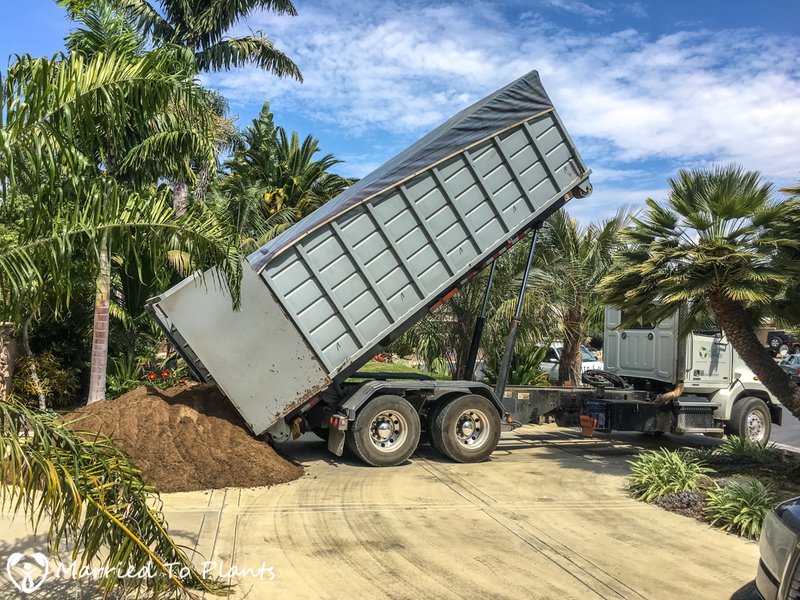 Nine yards of Bioswale Mix (50% sand, 30% topsoil, 20% humic compost) was delivered from Agriservice in Oceanside. 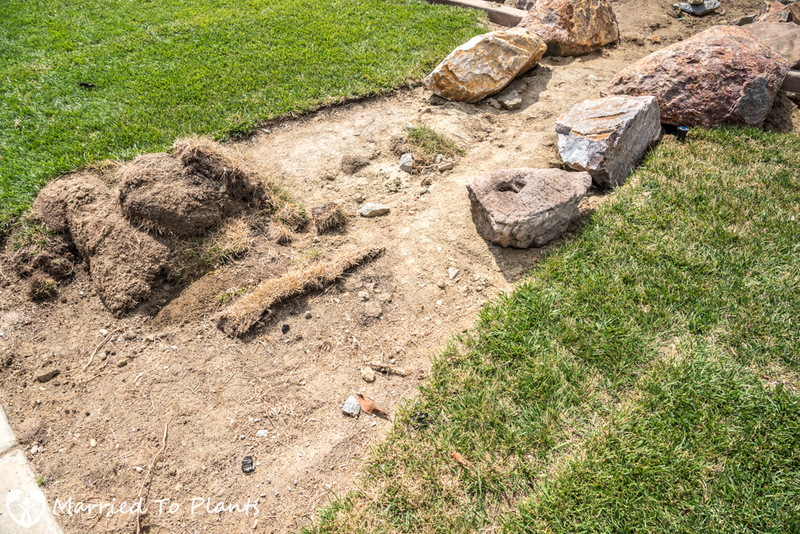 The soil was used to pile up against the outside of the large boulders that are in the planter beds. 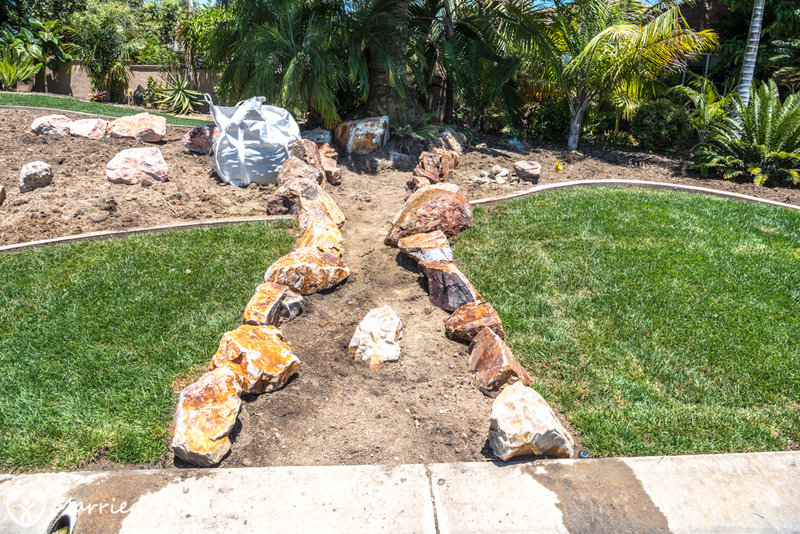 By raising the soil level on the outside of the boulders, it helps give the illusion that the dry creek bed is lower than the ground around it. 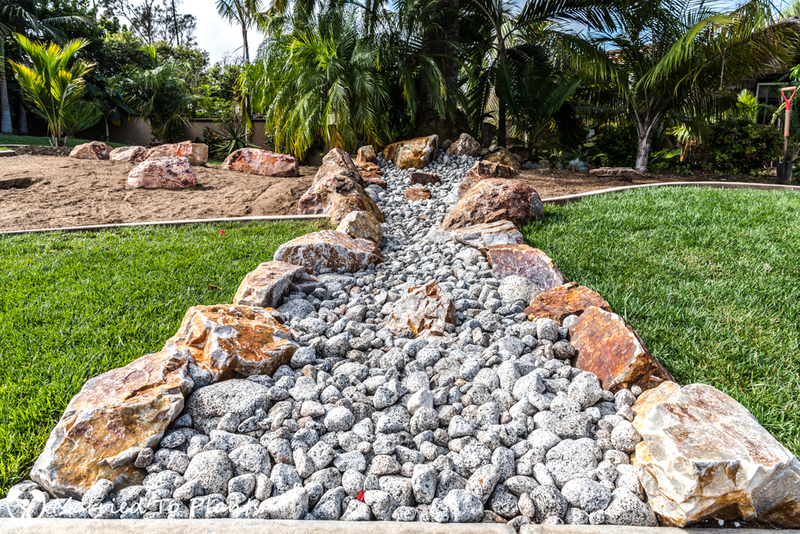 This effect makes the dry creek bed look much more natural. So what do you guys think? Do the Robin’s Eggs pebble work or are they too bright? 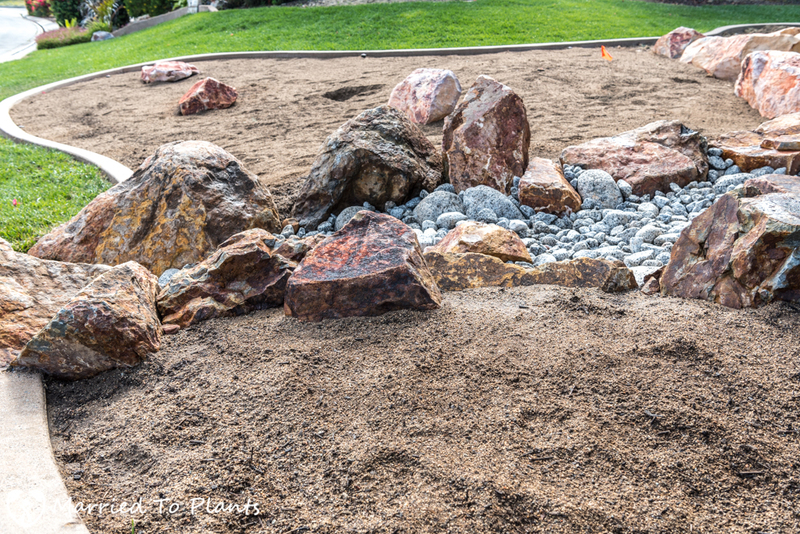 Does the dry creek bed look like something you might find out in nature? Personally, I am pleased with the results. Plus the best part is that my son and I made a lasting memory by building this together. My wife and I never plan on moving, so someday my son will be bringing his kids by telling them grandpa and he built this. As I touched on in the beginning of this blog entry, I still have a few more finishing touches to put on it that I didn’t get to in time for this post. 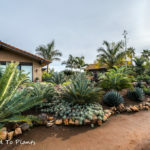 For example, I plan on adding a few small xeric sedges in the bed itself and of course many plants will go into the ground outside the bed. Once this is finished I will return here and add some updated photos. I think the best part is the time you spent with your boy. He’ll forget it was hot and that he would rather have been playing video games and remember being with you as the best good thing. Maybe you’ll turn him into a plant lover eventually. Not a fan of dry creek beds. Very few look natural. Your craftsmanship is absolutely first-rate and the stones are beautiful but the two different stones seem so different. A famous landscape architect I overheard once said if you want a dry creek bed go out hiking and in the wild and look at a hundred dry creek beds before you do anything. They are very different than what people build. He also said if you use stone use stone colors that could be found in your immediate area because it will look the most natural. 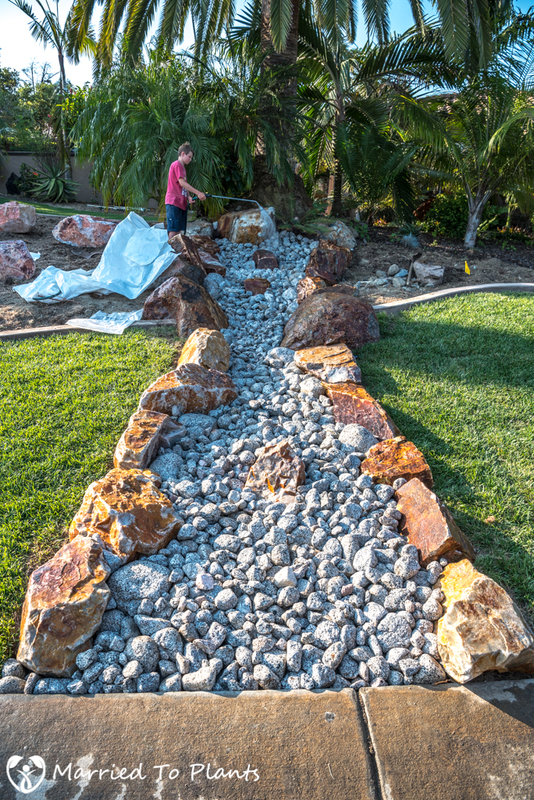 I went and googled images of dry creek beds, and what comes up are the ones people have built, not the ones out in nature! Thanks for your comments. Still waiting on the white stones to grow on me. I do wish I had stuck with a similar colored stone. Anyways,you got it looking nice no matter what. I tripped mapping it out with bend like I do all my pathways but there isn’t enough room with those boulders. It does start fat and go skinny in middle and widen again. Hard to tell from photo. But meander would have been good. 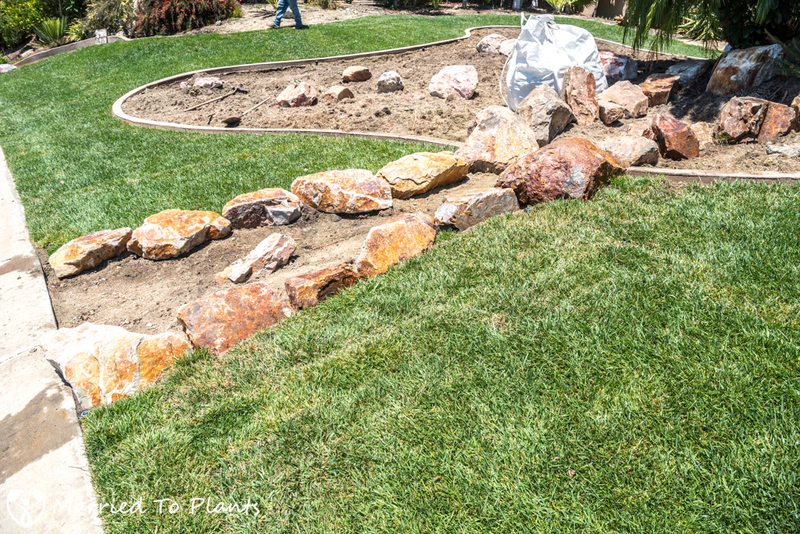 I wanted the rocks to be straight so when the grass grows against them, a trimmer can make clean lines. 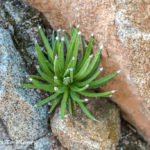 I hate when grass sprouts up inbetween rocks. 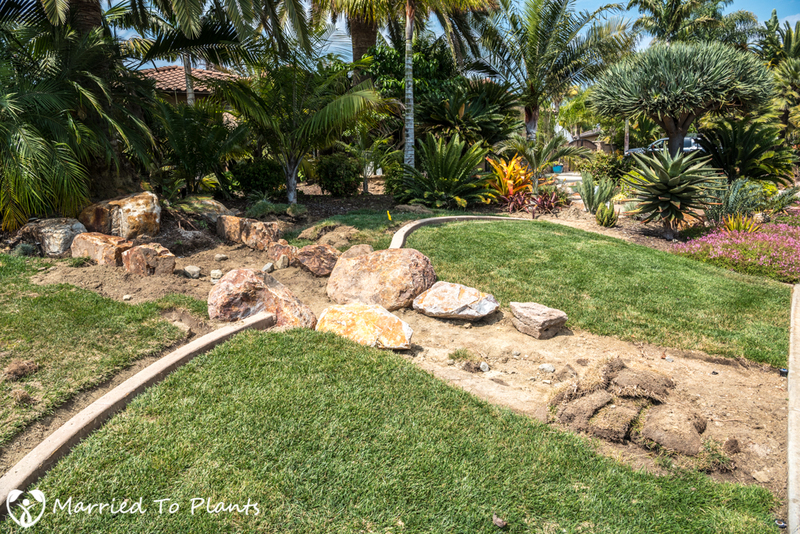 The rocks were made to form a mow strip basically.